Synopsis: An astronaut is transformed into a murderous gelatinous mass after returning from an ill-fated space voyage. The Incredible Melting Man is something of a throwback to those 1950s SF-horror movies in which an astronaut returns from space infected by some body-transforming virus. The particular movie which springs to mind is The Quatermass Xperiment (1955), although the fact that they share similar storylines is the only thing these two films have in common. The Incredible Melting Man opens with the return of a manned flight to Saturn during which leading man Alex Rebar, who will soon become the eponymous freak, demonstrates just why he has only one meaningful line of dialogue in the whole movie. Apparently, you’ve never seen anything, until you’ve seen the sun through the rings of Saturn, according to astronaut Steve West. And apparently seeing such a sight really isn’t worth it because it gives you a nosebleed, puts you into a coma, and makes your skin fall off – although why exactly is never explained. The next time we see Steve, his head is swathed in bandages and he’s strapped to a bed over which Doctor Loring (Lisle Wilson) is frowning. Apparently, Steve’s the only survivor of the Saturn mission, but his condition is strictly hush-hush, as we learn when Loring brusquely prevents a nurse from getting an orderly to perform a blood transfusion. The nurse must do it herself, but while she’s off fetching some blood, Steve wakes up and effortlessly frees himself of his restraints. Having noticed the nasty state of his hands, he stumbles over to a mirror and rips away his bandages to discover that his skin is literally melting from his face. Understandably upset, Steve sets about trashing his room with superhuman strength before chasing after the nurse who returns at just the wrong moment. She’s not exactly waif-like, the poor lass (truth be told, she’s a bit of a chubster, and director William Sachs does her — and us — no favours by showing her flight from Steve in slow motion) but she still makes it out of the strangely deserted hospital before Steve catches up to her and rips half her face off. This sounds like a case for Ted ‘I’M DR. TED NELSON!’ Nelson (Burr DeBenning), and Loring doesn’t waste a moment filling Nelson in on the details of the case. Somehow, Loring knows that there’s not much of the old Steve left inside that melting carcass – just the occasional flash of memory – and what has replaced him instinctively knows that it must feed on human flesh in order to slow its meltdown. The military, in the lone form of General Michael Perry (Myron Healy), also gets involved and the two men embark on a hunt for Steve which, when you think about it, shouldn’t be too difficult. I mean the guy’s skin is like congealed pizza topping, and he’s leaving bits of himself (including an ear) all over the place. However, Nelson and Perry spend the rest of the movie looking for Steve without success while he roams the countryside killing whomever his sticky path crosses. 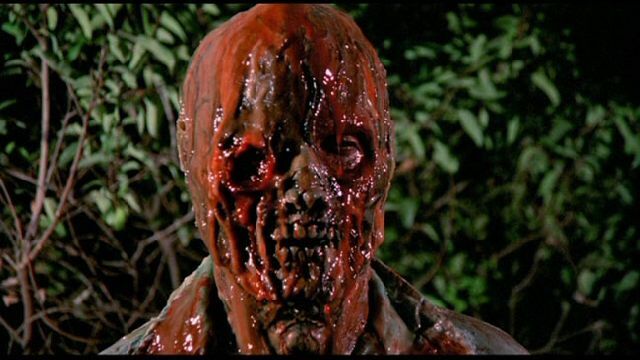 The Incredible Melting Man is made by a man who clearly doesn’t know how to make films, and were it not for the superb make-up job by special effects guru Rick Baker, this sorry effort would have no redeeming features whatsoever. Apparently, Baker quoted some ridiculous price for doing the job in order to dissuade the film’s producers from hiring him and was wrong-footed when they somehow met his demands. Either way, it’s clear that Steve’s melting skin is clearly where the lion’s share of the budget went, and it really is the proverbial nugget of gold in a sea of… mud. Perhaps the easiest way to give you an idea of just how incongruous Baker’s work is to the rest of the movie is to give a converse example. So imagine if the makers of Star Wars (on which Baker also worked) ran out of money and gave the part of Darth Vader to a sock puppet. That’s how bizarrely out of place it is. 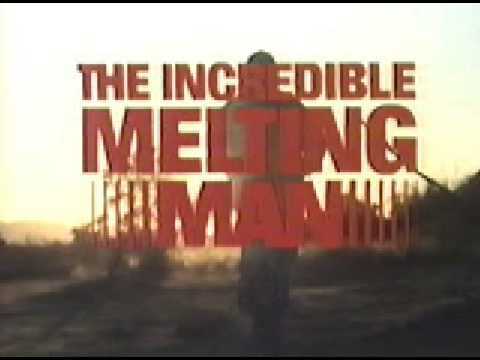 Although The Incredible Melting Man is only 84 minutes long, that still leaves us with about 64 minutes more film than plot, and things drag badly as we see Steve stumbling around the countryside wondering, like us, just when the military is going to deploy a few units to hunt him down instead of relying on a couple of dimwits like Nelson and Perry. And the thing is, they never do catch him! In the end, Steve gets so fed up waiting to be put out of his mystery he helpfully places himself next to a dustbin and melts all over the ground until all that’s left of him is a gooey mess that some disgruntled janitor has to sweep up the following morning.